Dice onion and garlic, throw in large pot with a spray of oil and cook over medium heat for 3-5 minutes till transparent. Peel and chop into 3 cm chunks pumpkin, add to pot with stock and cumin. Bring to the boil and cover, turn down to simmer 15-20 minutes until all is soft. Allow to cool and blend till smooth. Re-heat to serve. Dollop with natural yogurt and sprinkle with dukkah (optional). 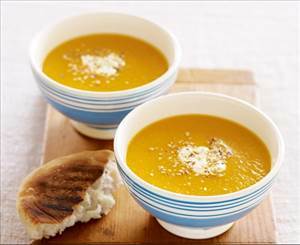 There are 102 calories in 1 serving of Pumpkin & Cumin Soup.